Will Oliver be On Tonight? Darren says he's good to go. Damon back in lineup. Boston bats cold, can't get runners home. Baltimore reigns 5-3 and has won 3 of the last 4 against Sox. Lead down to one game over Yankees, yes-yes. 9.25.95 - Chicago Cubs Frank Castillo tosses 8.2 no-hit innings before surrendering an opposite-field triple to Cardinal Bernard Gilkey in 7-0 win. Pena Problems! Juan may be long for Pawtucket. C'mon Grady, get the Little lineup right. FINAL: Boston 7 Baltimore 0. A's Beat Yanks 6-2. Sox Lead Division by 1. Can Sun Close? 94mph yesterday. 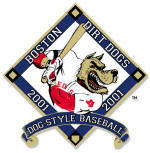 Dirt Dogs, Gang Green, and Black and Bruins all win again! Sox Can't Play in the Yards. Lopez, Julio Shut Down Boston 5-3. Let's be Frank, he stunk last night. Sox lose 7-5. Me See Julio Throw Down By The Camden Yards. 99˚ Heat. We need to get some relief. Sox winning streak snapped at six. Road streak dead at eight. Quiet man Castillo keeps streak alive tonight. Sox take two, sweep series, set new road win record, and extend first place lead over Yankees. Celtics win first playoff game in seven years, Bruins win first playoff game in three years. And overrated Drew Bledsoe traded to Buffalo for a #1 draft pick. Sox off to best away start in club history, 8-0 on the road. Puts on Batting Damonstration with Four Hits, Grand Slam. Sox Survive Another Urbina Adventure, Hang On to Sweep Kansas City in Nightcap 8-7. Five home runs, Wakefield perfect, Sox crush Royals 12-2. Burkett and Lowe set to go. Celtics and Bruins will make it a clean sweep. Damon back, finger OK. Yanks four out in loss column. Merloni is the Move. On-Again-Offerman. Pedro one-hitter for eight. 95mph fastball, great change. Hillenbrand Comes Through with 3-RBI triple. Sox Get By George, KC 4-0. Kansas City Here He Comes. Sox will stop Royals from running the bases at will. Revenge for last week, last year, all those losses at Royals Stadium in the 80's, takes place now. Hillenbrand Hits 3-Run HR, Leads AL in RBI. Sox Clobber Jays 14-3. Derek the Dominator Punches Out Nine, Knocks Out Yankees. Oogie, on the Ropes, Staggers but Won't Go Down. Red Sox Take 3 of 4, First Place Back. Is Guapo eating Rich food again? ?